sets still hold value. The bricks range from fairly great condition to poor. be a huge help, thanks. Hello and welcome to the forum. 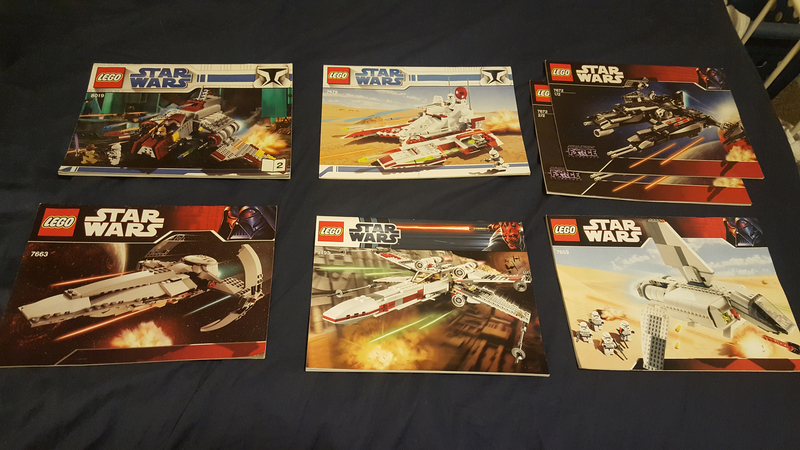 I'm guessing you can do the same in the USA, but one way you can sell your sets and get a pretty high sum without needing to spend a really long time sorting, is by putting your sets up for sale in a local (as you can get) toy auction. Collectors or traders will notice the rarer Star Wars parts and there's usually some up for a gamble. Otherwise, I guess just try to assemble them gradually. My suggestion would be to identify the most valuable sets first and get those sorted and sold. Once you hit the value vs. 'your time' threshold, I'd find someone with a Bricklink store willing to take the time to sort out the rest. 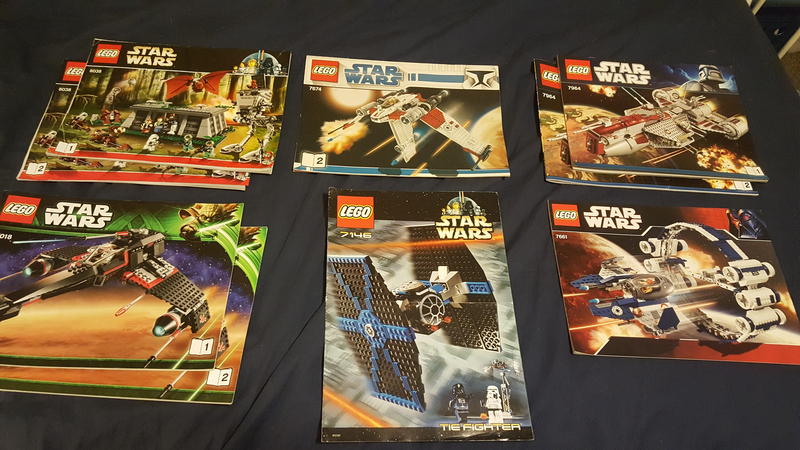 People often think they are sitting on a 'goldmine' of LEGO sets, but they don't factor in the time to sort, complete, list, sell, and ship sets. They also don't factor in all of the costs associated with each step in the process. It may feel like you're getting less value, but not monopolizing your free time for the next decade is probably better. If you have a Blockade Runner or a Cloud City, that'll be worth your time. I'm guessing you really don't want to wait around three years for a Wookiee Catamaran or A-Wing to sell. 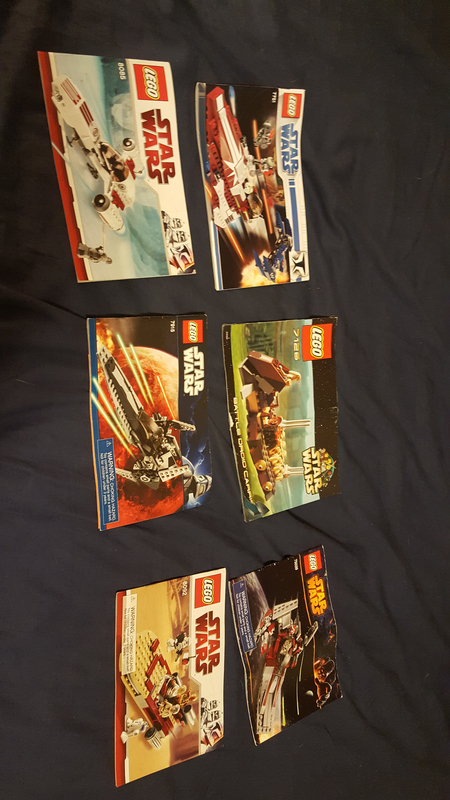 I picked up a storage bin three years ago with most of the 2003/2004 ESB SW sets. 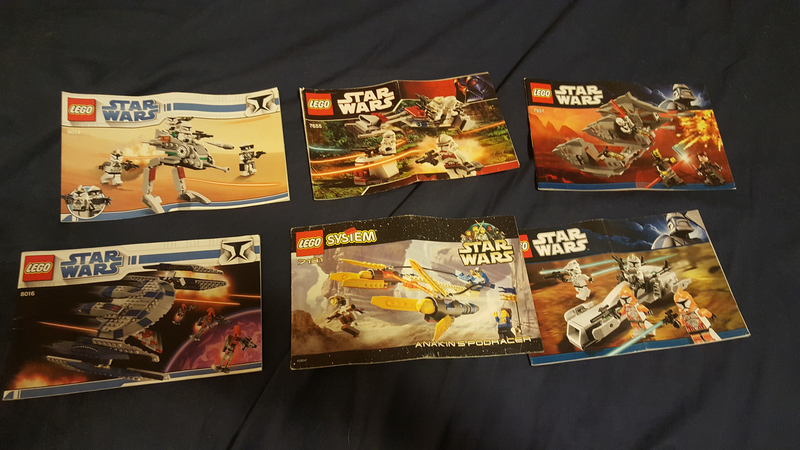 (AT-AT, MF, Dagobah X-Wing) I still haven't sorted the pieces of the AT-AT. I enjoy piecing sets together as a puzzle, and I got pretty good trade value on this site for the sets I got back together, but it wasn't a moneymaker by any means! Is sorting, building, displaying and becoming an adult fan of LEGO/collector off the table? Pictures of what you have might help. I also wouldn't describe it as gigantic until it is clear what you have. It sounds like a reasonable collection of bricks at the moment. 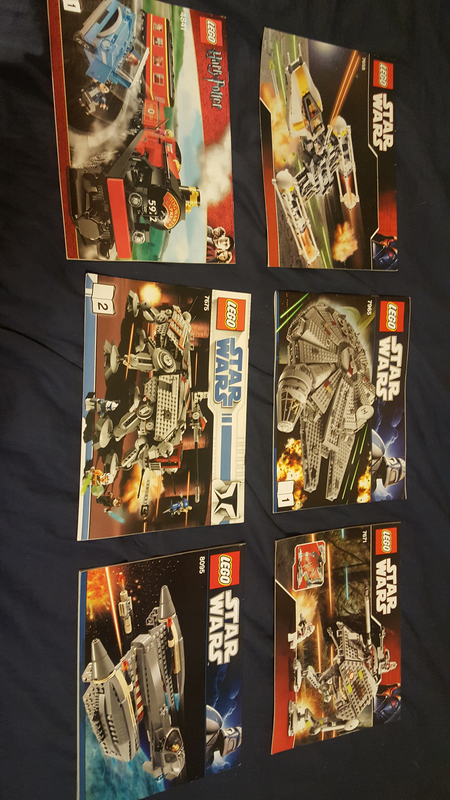 Moving that towards a SW collection is going to take time, especially if bricks are completely mixed up. And even then it might not be gigantic. 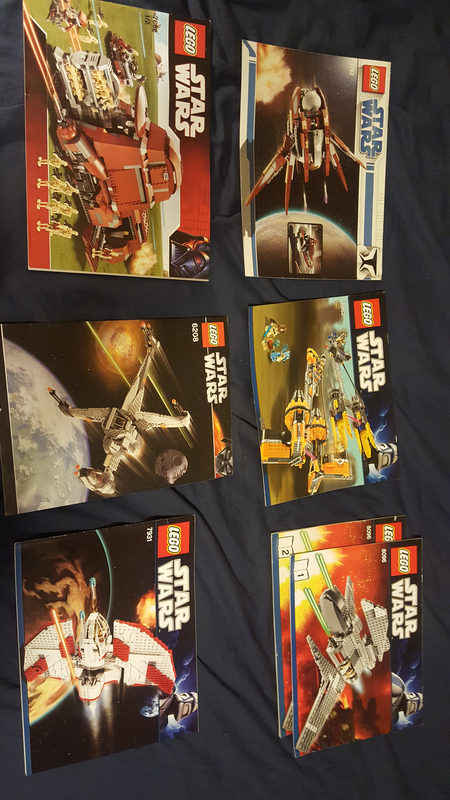 These are all the manuals to the sets I have, plus I have more without instructions mixed into the tubs. Are the sets all broken down? 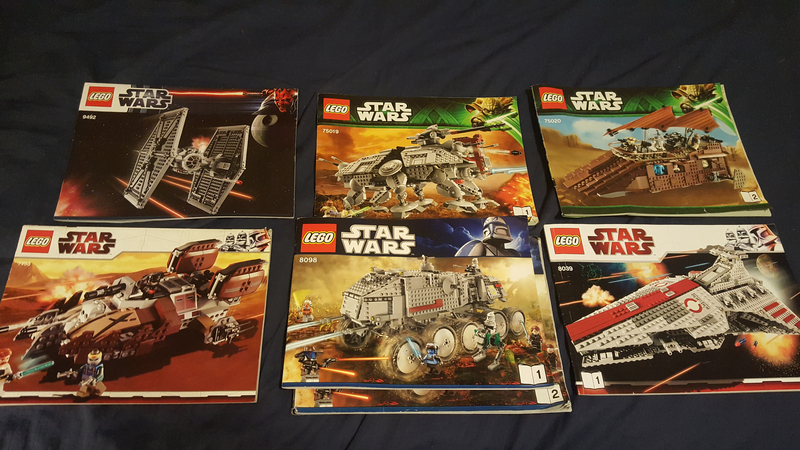 I've almost finished going through just one 25 gallon tub of mostly Star Wars that contained #8012, #75103, #75007, #9516, #7877, #8038, #9496, #7675, #7673, #7676, #7680, #7965, and a few smaller sets. 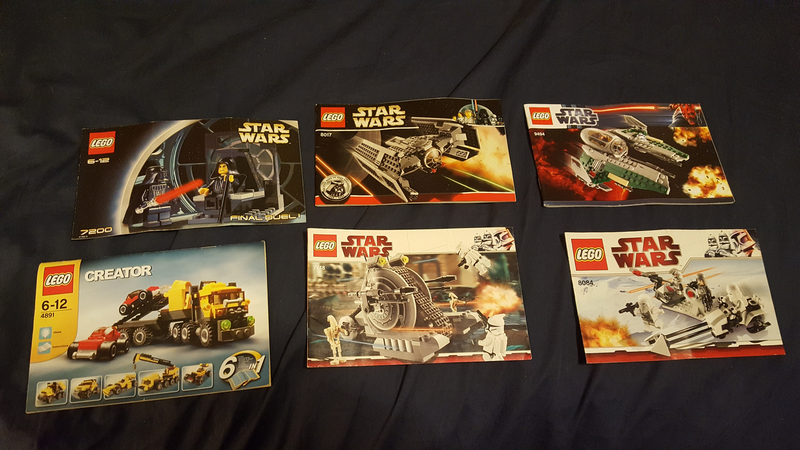 I'd guess I spent around 5 or six hours a week over 3 months sorting through that tub, and several of those sets were already half-built - but I had no instructions, so I had to browse through sets on Brickset to figure out what was in the tub. Yeah, all of them are unfortunately. They're split up into four 25 gallon tubs. ...your parents/grandfather/family clearly loved you more than mine loved me! That's an awesome collection! I'll back up what @datsunrobbie said as far as time. I picked up a 25gallon tub several months back and have spent months going through putting things back together. It's not a fast process by any means. To +1 some comments up above, I'd pick some of the higher grossing sets and start there, if anywhere. 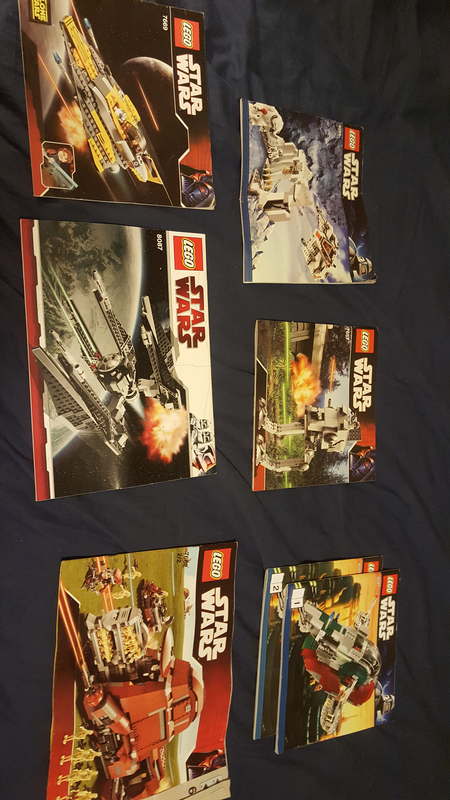 I hate to be the bearer of bad news, but that's barely $1000 of sets there, all complete in good condition. I agree with @SprinkleOtter. 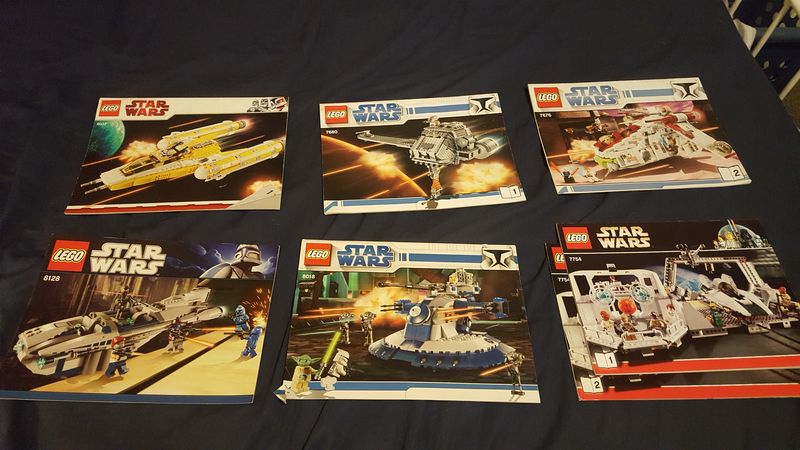 It's worth picking a few of those sets out of the tubs, but I think most of those either have subsequent re-releases or are less collectible. I think the only thing you can do here is pull out the minfigures from the set instructions you have and make sure they are 100% complete head to toe. Then pull out all of the other minifigures from the lot and picture them separately. Then take pictures of the Lego parts spread out so they can be viewed and either sell them that way on Craigslist which I don't advise or Ebay or maybe here. You won't get top dollar that way but you won't spend the rest of the year sorting and building Lego sets. Add to that the Trade Federation MTT. There has been a remake but that one is still far and away the best version and highly sought after. When all is said and done, how much are you trying to get for all this, and how much time are you willing to put forth to get that amount? Personally, I think it just amounts to 4/25 gallon totes of miscellaneous lego until you can put something(s) complete together. I also think in situations like this, the lot may be worth more to you then to anyone else in this state. Who knows, some day it might be worth spending 2 hours to reassemble a set and rediscover your youth. In my attic are boxes with my kids names on it and the phrase "remember when you were 10?".... 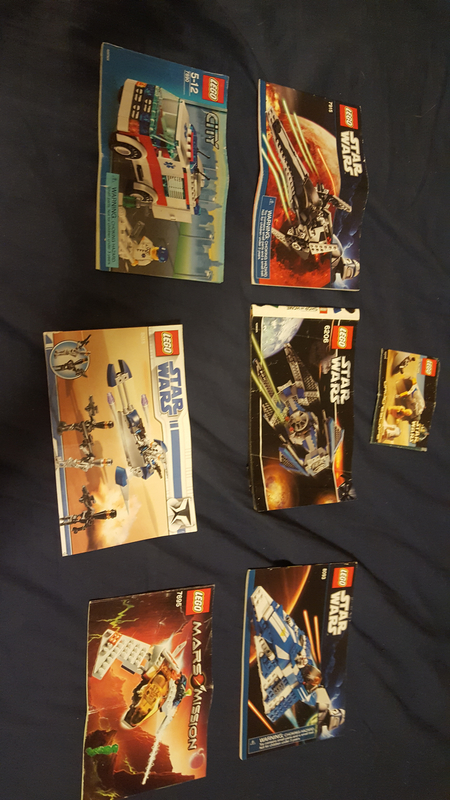 inside are lego sets they played with when they were 10. There are other boxes from preschool loaded up with Handy Dandy notebooks and Blues Clues stuff. And no, my kids have no idea the boxes are there. This. 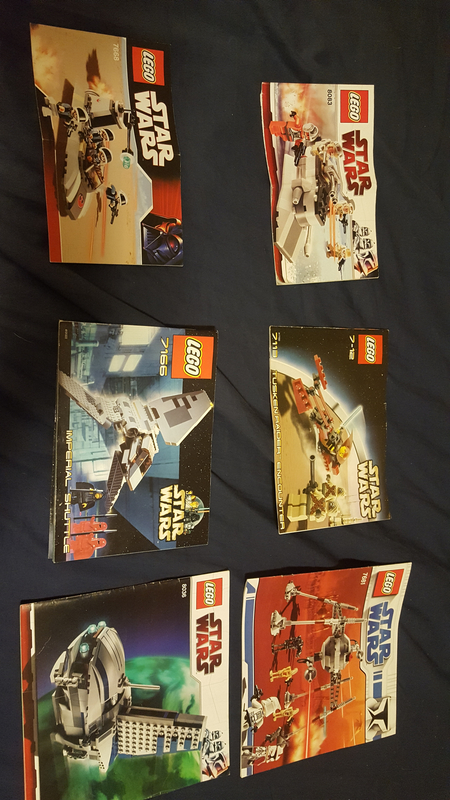 Sell the minifigures separately, then parts as a job lot by weight. 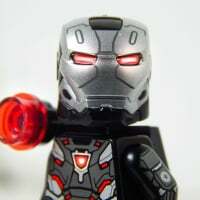 You might want to inlcude the instructions but make sure you say the minifigures are gone. If need be you could split it into 10lb batches but you are probably best off doing it in one go if you can. Just my thoughts: Unless you really need the money, KEEP IT ALL. 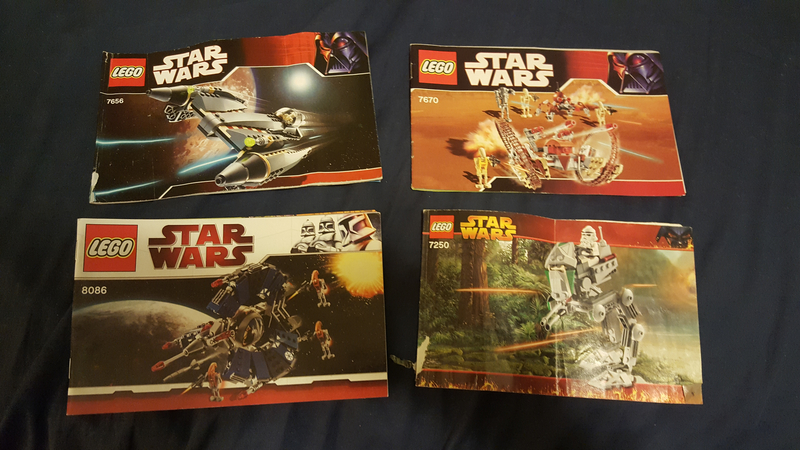 You've come to a very biased site for guidance, as we're all AFOLs, but my own personal experience is that I am so glad that my parents kept all of my LEGO, that I was able to rediscover when my children were old enough to appreciate it. It had the side effect of bringing me out of my Dark Ages and it's now a major hobby for both me and my daughters. If I had been asked about the sets when I was a young adult, I'd probably have done what you are thinking about and then regretted it hugely later on. You also mention sets that used to belong to your father from the 1980s, but you haven;t posted any of them. There are potentially some gems buried in there as well. Store it away somewhere safely for now.